Let The Below Information Help You See The Light! "Why wasn't the 1993 Brain-Pad study not taken seriously and why the retail community has complete disregarded carrying Brain Pad." With over 600 class action suits in the NFL Brain-Pad's science has been asked for by attorneys representing former NFL players and the damage inferior mouth guard is being studied in Kansas City currently by a independent team of medical professionals. 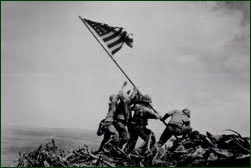 Even with all this, many can not comprehend why after 2 decades of science and mandates in the United States and Middle East in combat arts why Brain-Pad is not on every youth playing sports! We do have a responsibility to reduce force, and products that increase force should not be sold. 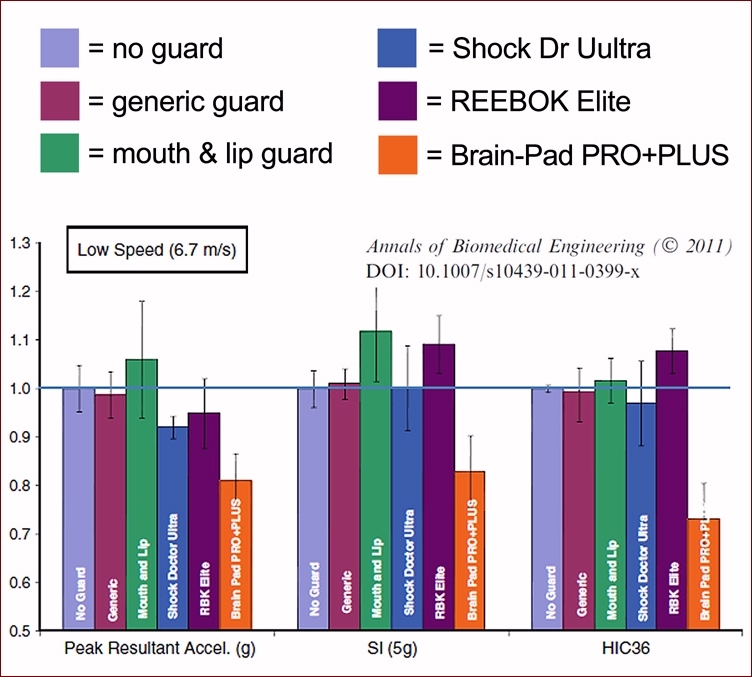 Below is the NFL funded mouth guard testing and analysis on the major (Mouth Guard) brands in the industry. As you will see as far as impact forces being transferred to the head, the upper mouth guards actually accelerated impact forces compared to wearing no mouth guard at all. Only the Brain-Pad Jaw-Joint Protector reduced impact forces being transferred to the head. This testing assures individuals who wear the Brain-Pad Jaw-Joint Protector are protected by the finest protection currently on the market. Effect of Mouthguards on Head Responses and Mandible Forces in Football Helmet Impacts. (Received 21 June 2011; accepted 8 September 2011) Associate Editor Stefan M. Duma oversaw the review of this article. The testing at Biokinetics and Associates Ltd was funded by the National Football League. Their support of the research on the effects of mouth guards on head responses is appreciated. The opinions presented here are those of the authors and not necessarily those of the NFL. The development of the articulating mandible for the Hybrid III, 8,41 cadaver testing and development of biofidelity corridors for impacts to the chin 6,7,9 and the series of helmet testing reported here were completed while the lead author was a member of the NFL's MTBI Committee and oversaw the research. 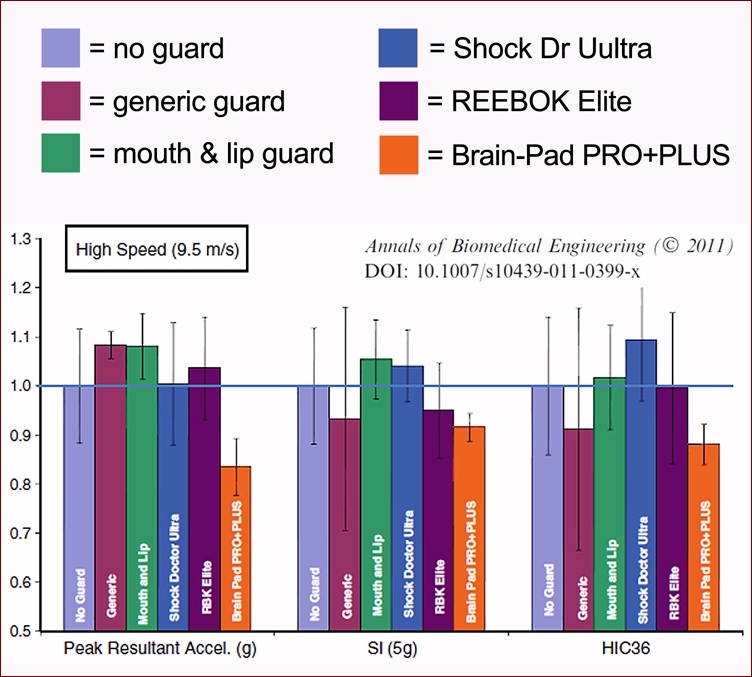 *Independent Observations by Dr. Tim Walilko, Phd., Biomedical Engineer at Applied Research Associates - 10 28 2011 "Brain-Pad's performance at 6.7m/s condition was far superior to any other appliance tested. 6.7 m/s Condition - showed a 26.9% reduction in H.I.C. & a 32.4% reduction in overall mandable forces. Both these results are statistically significant. Other appliances tested actually had increases in S.I. & H.I.C. suggesting that there is an increased risk of concussion with their use. 9.5 m/s Condition - Even in the higher velocity impacts the PRO Plus was superior to the other appliances.". This is the 3rd in a series of tests that showed the Brain-Pad significantly reduces forces to the base of the skull, TMJ and Brain. The other 2 were 1993 and 2005. 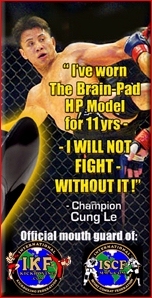 For More On Brain-Pad Click HERE! This post was made by International Fight Sports and it's Associate Organizations. This is NOT a Paid Advertisement or an Advertisement at all! 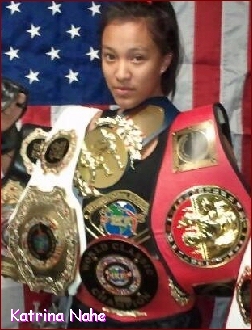 International Fight Sports and none of it's Associate Organizations have received any financial or merchandise compensation for this post, nor will they in the future! This is simply an article to make those involved in contact sports aware of how much Brain Pad could help you! HERE - Second Impact Syndrome! "IKF Muay Thai / KICKBOXING"
Winner: Diondre Perry by unanimous decision, 29-28, 29-27, 29-27. Winner: Trevor Porter by unanimous decision, 30-27 on all 3 judges cards. Winner: Salvador Becerra by unanimous decision, 30-27, 29-28, 29-28. Winner: James "Stone Cold" Rodriguez by unanimous decision, 29-28, 29-28, 30-27. Winner: Michael Hutchins by unanimous decision, 30-26 on all 3 judges cards. Winner: Doug Reynolds by TKO at 1:46 of round 3. Winner: Chase Thorpe wins by split decision, 29-28, 29-28 and 28-29. 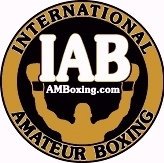 Winner: Aber Boutavong by corner stoppage at the end of round 1. 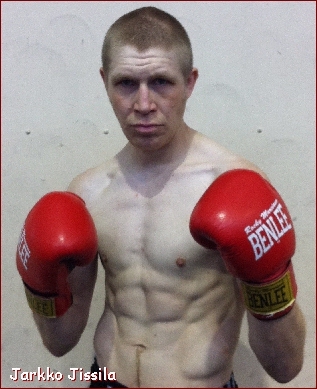 Winner: Matt Baker by corner stoppage at the end of round 1. Winner: David Wheeler by unanimous decision, 29-28, 30-27, 30-27. Winner: Jeremy Jacildo by DQ (knee to the back) at 0:17 in round 2.
defeated Michael Lawlor (Inveeal, NSW, Australia) by unanimous decision, 30-27, 30-27 & 28-27.
defeated Drew Robinson (QLD, Australia) by split decision, 29-28, 30-29 & 28-30.
defeated Joey Evans (Ipswich, QLD, Australia) by unanimous decision, 30-25, 30-27 & 30-24.
defeated Ozan Ulker (Glenroy, Melbourne, Australia, 10-4, 71.3, 5'9", 7-12-76, Self, +61 405426746) by TKO at end of round 3. 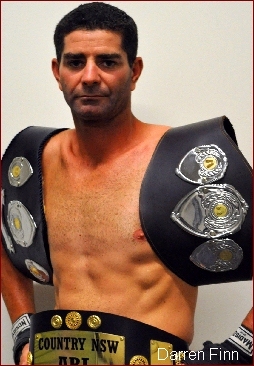 Corey Sullivan is the new IKF Amateur Modified Muay Thai Rules Australian Light Middleweight Champion. PHOTO. 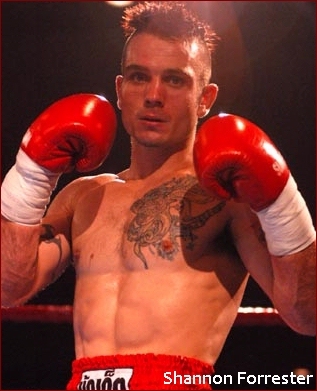 IKF has issued Ozan Ulker a 30 day medical suspension for his Knockout until April 25th, 2012.
defeated Evan Stewart (Kempsey, NSW, Australia, 16-3) by unanimous decision, 50-44, 50-45 & 49-42. 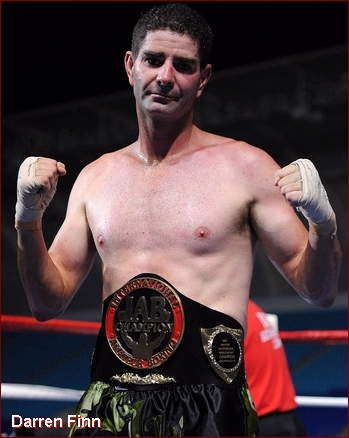 Darren Finn is the new IAB Amateur Australian Middleweight Boxing Champion. PHOTO. 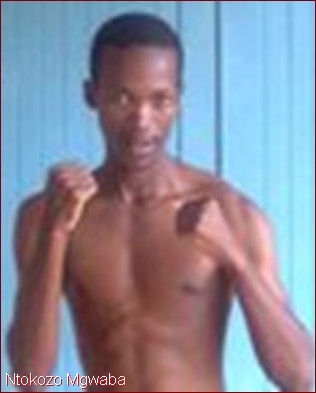 had already won his title on the scales when first opponent Ntokozo Mgwaba of Durban, KZN, South Africa failed to pass his Visa out of South Africa. However, having travelled approximately 40 hours from Finland, Jusilla still wanted to fight. So a potential substitute, Shannon Forrester of Cairns, QLD, Australia, (68-18-2/22) stepped in. However Forrester weighed in 9 kilos heavier than Jusilla. The spread was outside of the allowed weight spread, so the two did a 3 round exhibition. 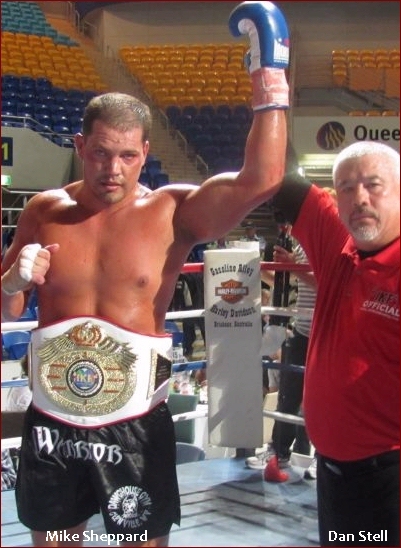 Jarkko Jusilla of Vaasa, Finland is the new IKF Full Contact Rules Intercontinental Welterweight Champion. 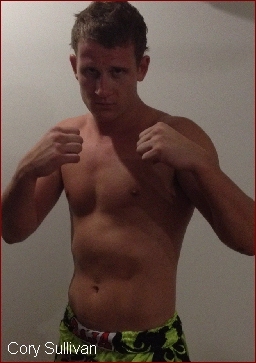 defeated Jarrod Mellor (Cairma, QLD, Australia, KB: 5-3, AB: 8-5, 80.7, 1.86cm, 6-3-89, Shannon Forister, 0422849551) by Knockout at 1:56 of round 3. 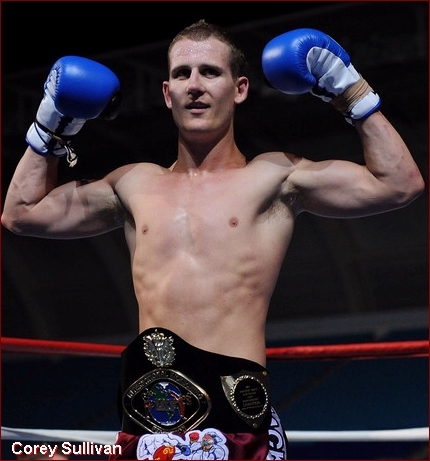 Davor Matarugic is the new IKF Amateur Full Muay Thai Rules Light Heavyweight World Champion. 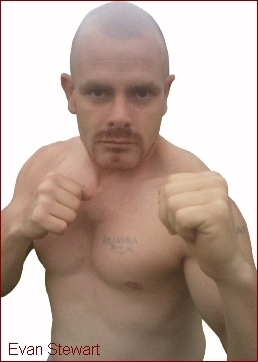 IKF has issued Jarrod Mellor a 45 day medical suspension for his Knockout until May 10th, 2012.
defeated Robert Wilesmith (Liverpool, NSW, Australia, 15-1/14 (?? ), 96.2, 6'2", 3-19-65, Deane Lawler, 045 114 0770) by TKO at 1:33 of round 3. 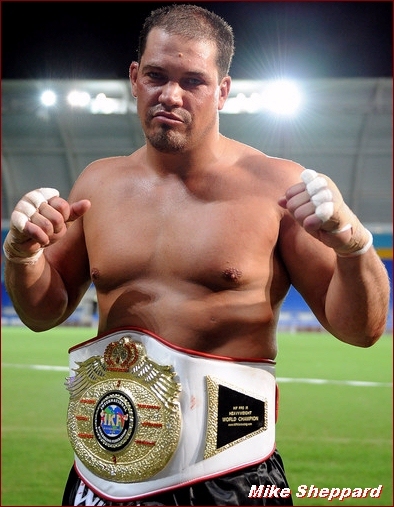 Mike Sheppard is the new IKF Pro International Rules Heavyweight World Champion. 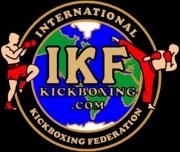 IKF has issued Robert Wilesmith a 60 day medical suspension for his Knockout until May 25th, 2012. This was the nights main event which matched up USA's Mike "Lightning" Sheppard (22-10-1/16) against Robert "Thunderlegs" Wilesmith (15-0) of Australia. This bout had a lot of hype and drama leading up to it so the question was, "Would the bout be bigger than the hype?" 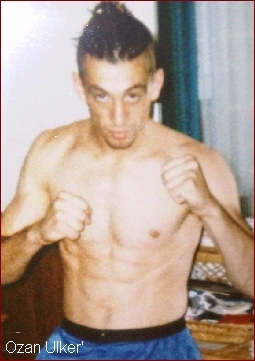 While many knew who Mike Sheppard was, (Current IKF FCR World Champion & Pro Boxer) there was little if anything known about the Robert Wilesmith and this is where the drama rose up. There were a series of circumstances that lead up to this bout (Click Here To Read Them...) with emotions and passion spilling in from all angles. 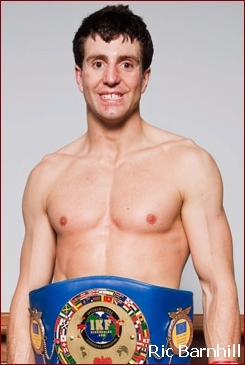 Wilesmith had stated an amateur record of 15-0 and a pro record of 15-0 with 14 KO/TKOs. 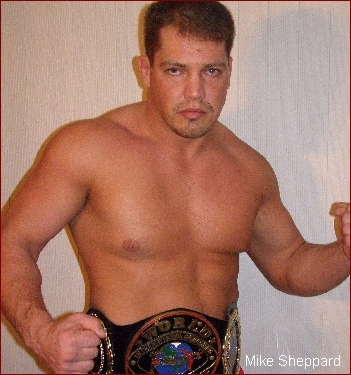 Although there were questions surrounding proof of his previous bouts claiming the undefeated combined pro and amateur record of 30-0, Sheppard didn't care. He simply trained as he would have for any other opponent coming into the ring claiming a 30-0 record. This being said, to put it straight out there, both fighters had trained for a strong World Title bout. Round one started slow, as we all thought it would. Sheppard wanted to see what kind of "Thunderlegs" Wilesmith had in his leg kicks he kept hearing Robert talk about and Wilesmith wanted to see what kind of "Lightning" Sheppard had in his punching since Sheppard is also a pro boxer. However neither fighter showed the other anything in round one that would send any kind of a message. Sheppard landed some head and body shots while Wilesmith got in a few jabs but not one strong landing leg kick. Towards the end of the round though the two clashed heads, which after the bout created some surprising stories in the Australian Press. Wilesmith would admit to others both in the ring and over the next two days that he had brought his head down and forward just like he did when he played Rugby Football. But he was surprised when the one who got cut was him. "I was getting beat so I thought I'd result to some of my ol rugby techniques." said Wilesmith after the fight. Clearly the headbutt was caused when Wilesmith's head leaned into Sheppard, however, days after the bout, Wilesmith had a different memory of the moment when giving an interview to the Australian media. "There was a bit of controversy. I was watching the video and it looks like he did it intentionally." Well, to begin with, Wilesmith is right on one account, it did look like he did it intentionally, but the "HE" was Wilesmith, NOT Mike Sheppard. As direct ringside eye witnesses of this bout we were pretty shocked to read this on the internet. Although an uneventful round, as the round came to an end, there was no question as to who won it. If not for the inexperience of one of the "Australian" judges (found later to be selected by Wilesmith) Sheppard would have won round 1 on all 3 judges cards, 10-9. However, the Wilesmith - Australian judges gave round 1 to Wilesmith, despite him only landing a few jabs, and we "Literally" mean a few, as in THREE. 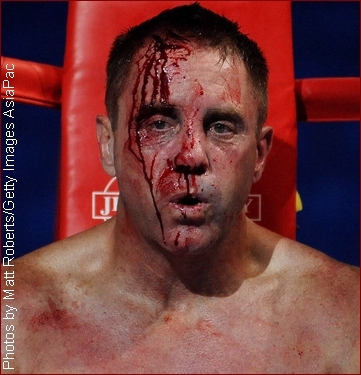 As round 2 started, Wilesmith's corner had stopped his head from bleeding so the fight was on again. However, as this round started, Sheppard realized he wasn't afraid of any "Thunderlegs" so he came out strong. Sheppard rocked Wilesmith with body shots and left - right combinations along with several kicks including a good head kick. To his credit, Wielsmith proved one thing, that he had a hard head but even a rock can take a strike, it doesn't express it has "Talent or Skill". As the round was closing out, Sheppard landed some bombs on Wilesmith that rocked him. Instead of covering up as most fighters would to protect themselves, Wilesmith smiled at Sheppard and actually waved him to come again. Wilesmith wanted everyone to "Think" he was having no problem taking Sheppard's blows, yet in reality, it was just the jesters of a fighter who had no answer to his opponent's offense. Saying that Wilesmith weathered Sheppards storm is not a compliment of skill... Having a hard head is not a compliment of skill... However, it's what Wilesmith kept doing which seemed to be the only things keeping him in the fight. As the round came to a close, this time there was no question as all three judges saw this round easily 10-9 for Sheppard. As round 3 started, Sheppard came out with no hesitation scoring punch after punch to Wilesmith's head and body. What many had hoped to be a tremendous fight quickly turned into a one sided frenzy or more so, the bushwhacking nearly everyone in Australia warned the IKF it would be! Sheppard was now landing shot after shot without any real resistance. Wilesmith would continue his only reply which was to smile back at Sheppard as if he wasn't hurt, but at ringside, the message was clear. Wilesmith was in PAIN!" From the corner prior to the 3rd round, Wilesmith was drained. Not only did he not have any answers to Sheppards attack, he had no gas ( endurance ) to even stand up to weather Sheppards shots anymore. Sheppard charged several times as Wilesmith just turned his back to him like a fledgling fighter who was just scared or had never fought in a real bout. It was clear this bout was coming to an end soon. 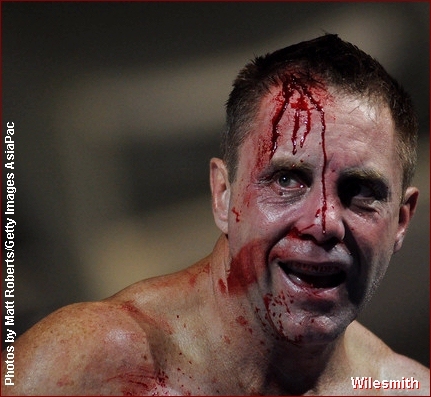 As we past the 1 minute mark in round 3, Sheppard drove the bloodied and battered Wilesmith into his own corner. It was there that Wilesmith would turn his back again to try and escape Sheppard. 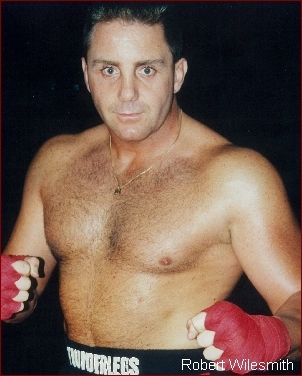 After World Class Referee and former Champion Kickboxer himself, Dan Stell (Click here to read about Stell's experience) stopped Sheppard from his attack, the two squared up again. A few blows later and Wilesmith was leaning over. Sheppard could have very well landed several telling head shots, but almost as if he felt sorry for him, Sheppard choose to go to the body instead to finish Wilesmith off. Finally Wilesmith went down. Stell started the count, but Wilesmith would not make the count. This long awaited bout was over and Elizabeth, West Virginia, USA's Mike Sheppard would win the IKF World Title by KO at 1:33 of round 3. Sheppard improved to 23-10-1 with 17 wins by stoppage while Wilesmith adds a loss to his record, whatever that record is or was claimed to be. 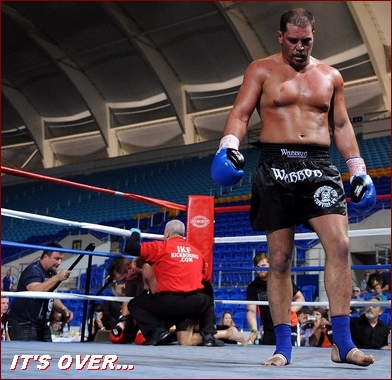 A loss that will likely be his last kickboxing bout. WHAT BOUT WERE YOU WATCHING? "Thunderlegs once again proving why he has that nickname as he destroyed Sheppard's legs." However, we had to ask what fight the writer was watching because Wilesmith's legs were no concern to Sheppard in this fight. Even Wilesmith's corner wondered why he never even turned his hips into any of his kicks. Maybe it was inexperience in the ring or fear of Sheppard countering? Who knows. What we do know is Wilesmith didn't throw "1" strong landing leg kick on Sheppard all night! NOT EVEN ONE! So to say Wilesmith "Destroyed" Sheppards legs comes from the eyes of a blind man. WILESMITH MAKES UP HIS OWN "FALSE" STORY! "but the loss of blood form the head gash and a broken nose took its toll." Bloodloss had NOTHING to do with this bouts outcome!! Sheppard simply beat Wilesmith down with shot after shot from rope to rope, corner to corner. Yes, Wilesmith was bleeding quite a bit, but to say the blood was "Gushing" is an over statement. 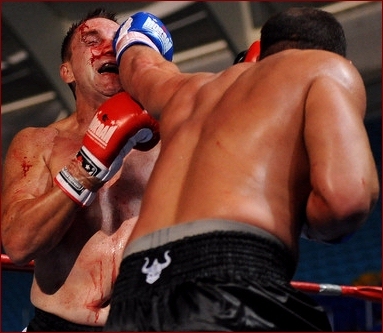 We've seen a lot worse blood in some elbow cut Muay Thai fights for example. "If it wasn't for the head clash, I reckon I would have won." Well, not sure what bout he was thinking about because after round 2 started, we saw this bout only going one way, Sheppard's! "Tremendous fight" or an "Out right War"
"He hit me with his best and I kept going. He kicked me fair in the head and I laughed at him." Although factual quotes, last we heard, taking shots have never been ways to score points... If this were true, Ken Shamrock should have been declared the winner in his last bout with Tito Ortiz in the UFC (The Final Chapter). This is a general view of the crowd at Skilled Park in Australia on March 24, 2012 on the Gold Coast. It would be safe to say, that Australians were right all along. And KNOWING this was not going to be a good bout, let alone one to pay money to see, we would sadly be safe to say that we doubt that even 100 people actually "Paid" for tickets to come see the event. 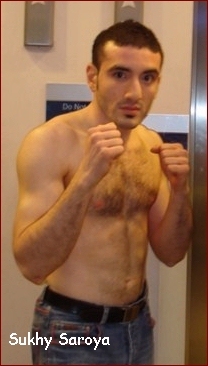 195.1- 215: Andre Valadderez, 0-0, out of Dublin, CA,Trainer is Kirian Fitzgibbons. For The Full Story Behind This Event & The Above Title Bout - "CLICK HERE"
(*) Ntokozo Mgwaba (Durban, KZN, South Africa) Failed to pass his Visa out of South Africa - Forrester stepped in the day of the event. (***) Mr. Allen self registered with the ISCF. to submit to the fight doctor of the event he is booked on a MINIMUM 1 WEEK PRIOR TO THE EVENT to be cleared to fight. This physical form can be found HERE. PAK 4 "Stand Up And Fight!" WINNER: Gonzalo Aguialar by unanimous decision, 29-28 on all 3 judges cards. WINNER: Anthony Westbury by Split decision, 29-28 , 29-28 & 27-30. WINNER: Guiherme Faria by unanimous decision, 30-27 on all 3 judges cards. Unlike his questionable draw with Guiherme Faria back in 2010, Faria left NO Question as to who won this bout. As in the past, Faria had some VERY Impressive kicks! WINNER: Anthony Hernandez by Split decision, 29-28 , 29-28 & 28-29. Fleucet had entered the ring with long "Full Contact Style" pants on. Since this was a Leg Kick/Muay Thai bout, he was asked to put on shorts. When he replied he didn't have any he was told by the CSAC he would be disqualified. ALL leg kick bouts must wear shorts so that each knows where the other knees are, to avoid them. Thinking on his feet as well as he did as a Kickboxing Legend, trainer Benny Urquidez - (Web) took out a pair of scissors and quickly made Fleucet's pants into shorts. WINNER: Brandon Chew by unanimous decision, 29-28, 30-27 & 30-27. Chew had several great combinations, but the one that made a statement over and over were his Strong Side Kicks! WINNER: Kai Sanpei by unanimous decision, 30-27 on all 3 judges cards. WINNER: Ruben Cassanova by Split decision, 30-27, 30-27 & 28-29. Although Cassanova took the decision, what stood out to us was Lee's Strong Side Kicks, making a statement with them as did team-mate Brandon Chew! WINNER: Abraham Tellez by unanimous decision, 30-27, 29-28 & 29-28. Nick Hillman took a standing 8 in round 2. WINNER: Harley Maldonado by unanimous decision, 29-28, 30-27 & 29-28. Maldonado is a very exciting fighter with some Great Head Kicks in his arsenal. WINNER: Marcel Cyprian by Knock Out at the very end of round 2. 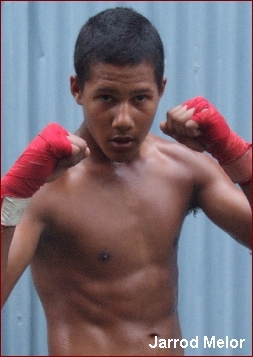 Cyprian is a smooth, composed fighter with some great combinations. WINNER: Frank Tapia by unanimous decision, 30-27 on all 3 judges cards. Although scoring while outside, Ladd moved in tight, where Tapia kept landing a load of knees to Ladd's stomach that Ladd never defended. WINNER: Honorea ( Nori ) Lim by Split decision, 29-28, 29-28 & 28-29. No offense to Boardman but to us, this was rounds 1 and 2 to Lim, and a toss of the coin for round 3. WINNER: Manny Mancha by TKO at 1:10 of round 2. For some reason, Mancha filled out his update card with a record of 1 win and 2 loses when he was actually 4-2 prior to this bout... ? CSAC allowed a 67.5 lb weight spread here. IKF rules only allow a 20 lb spread for the weight of the lightest fighter. However when a state commission regulates an event, the State rules stand over any and all sanctioning body rules. WINNER: David Catano Jr. by Knock Out at :21 seconds of round 3. 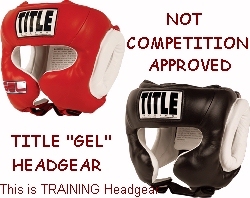 He used a Title GEL "Training Headgear" - For legal headgear, click HERE. In Catano's defense on the headgear issue, CSAC allowed a 6 lb weight spread here when the max is 5 which had Wombles outweighing Catano by 6 lbs. And again... When a state commission regulates an event, the State rules stand over any and all sanctioning body rules. WINNER: James Cornick by Unanimous Decision 58-56, 60-55, 59-55. WINNER: Jimmy Johnstone by Rear Naked Choke Submission 3:22 Round 1. WINNER: Ross Terry by Unanimous Decision 30-27, 30-27, 30-27. WINNER: Luke Cuthill by Split Decision 28-29 29-28 29-28. WINNER: Ian Squire by Majority Decision 29-28, 29-28, 30-30. WINNER: Majority Draw 29-29, 29-29, 30-27. WINNER: James Crowe by Split Decision 28-29 29-29-29-28. WINNER: Heidi Guldseth by Split Decision 30-27, 28-29, 29-28. WINNER: Odd Anders Vedding by TKO (Corner retirement end round 2). WINNER: Patrick Halforty by Split Decision 29-28 27-30 30-27. WINNER: Juris Poskus by Unanimous Decision 29-27, 29-27, 29-27. WINNER: Martin Avery by Unanimous Decision, 50-44, 50-44, 50-44. WINNER: Dean Alexander by Unanimous Decision, 29-28, 30-27, 30-27. "What this picture means to me as a Coach, it highlights years of hard work, dedication, sacrifice, blood, sweat, tears, wins, losses, joy, heartbreak, fights every weekend, tons of travel and time away from our families, through it all these people have been my friends, my team and my "other"family, they work all day everyday (sometimes with 2 and 3 "real" jobs as well) to get better, be better, to be more then they were yesterday....what makes this picture so special to me is that many of these people represent the forgotten, the overlooked, and the damaged... in this picture you will see abused and neglected children from broken homes, people born with debilitating chronic health issues, immigrants who came to this country with nothing, women who have survived and overcome domestic violence, people who have come back from career ending injuries, people who lost their parents far to young, recovered alcoholics and drug users, people who were once well over 300 Pounds, people who have been institutionalized and given up on... what do I see?? I only see Survivors, Fighters, and Champions....People who no matter what life has thrown at them NEVER GAVE UP...this is my Family!" "CSA GYM = Champions in the Ring...Champions in Life!" At a packed Oceania Nightclub James Wallis retained his IKF European title with a clear points win over Germany's Rene Tauber who despite an impressive record did not threaten at any time to take the title from Wallis. In the co-main event the exciting fight for the IKF Amateur World title between Kelly Mainwaring and Monika Markowska ended in a draw. The 3 judges unable to split them after 5 hard fought rounds. No one likes a draw and so a rematch is being sought for early summer. Defeated Josh Dennis (Swansea, 2-7, BX: 30-9, KB: 1-1, 77 kilos, 2-10-89, 6'1", Eddie Grove, 0044-7942966161) by Tapout due to Triangle Choke at 1:48 of round 1.
defeated Darren Morcom (Swansea, 0-1, 90 kilos, 12-3-87, 6'1", David North, 0044-78255323058) by TKO in round 2.
defeated Nicola Giles (Bridgewater, 0-1-1, 59 kilos, 16-12-89, 5'2" Arthur Meek, 0044-7763242277) by TKO in round 1.
defeated Julian Evans (Swansea, 0-1, 74.7 kilos, 22-3-88, 5'10", Matthew Evans, 0044-7807146663) by Referee Stoppage at 2:03 of round 2. Shaun Smallbones Recieves Medical Suspension Until 26-03-12. WINNER: Ro Allen by Unanimous Points 50-44 50-44 50-44. WINNER: Split Decision Draw, 28-30 29-29 29-28. 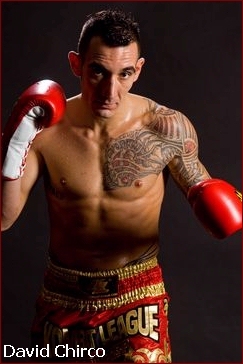 WINNER: Montana Attard by TKO 1:29 Round 2. James Thompson Recieves Medical Suspension Until 26-03-12. WINNER: Jake Mcleman by Majority Decision 30-28 29-27 28-28. WINNER: Majority Draw 50-47 48-48 48-48. WINNER: Jamie Reynolds by Rear Naked Choke Submission 2:59 Round 1. WINNER: Mark Ogden by TKO 1:01 Round 2. Dane Wakeman Recieves Medical Suspension Until 26-03-12. 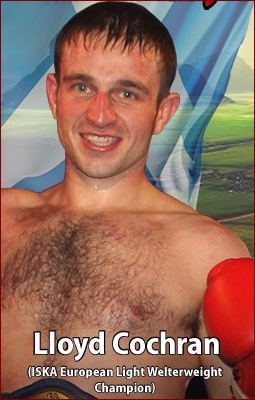 WINNER: Harry Mcleman by TKO 1:25 Round 3. Milan Tomes Recieves Medical Suspension Until 26-03-12. 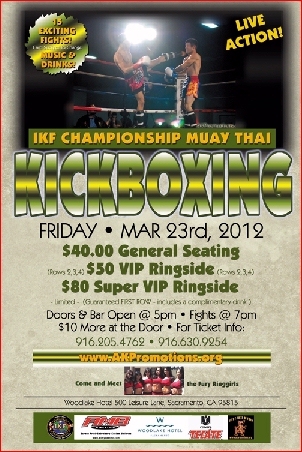 "IKF Junior Light Contact Competition"
Friday, March 23rd, 2012, The Woodlake Hotel of Sacramento, CA (Formerly The Radisson Hotel) located at 500 Leisure Lane will be the location for another exciting edition of IKF Muay Thai Kickboxing. The popular show that features up to 17 bouts of full contact kickboxing action between men and women, will return to Sacramento laced with a Las Vegas appeal to the delight of the thousands of fight fans! Local promotions company AK Promotions based out of Rocklin, CA will be producing this exciting event. AK Promotions is one of the most aggressive promotions company in the area for putting on such events and have been noted as one of the best promotions companies for Kickboxing in the country. The shows are loaded with action, theatrical lighting, beautiful ring girls, adult beverages and lots of great food combined with blasting music and videos to set the stage for a great evening out on the town. 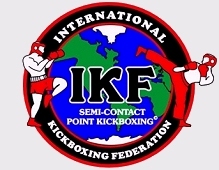 IKF Muay Thai Kickboxing events have been packing ballrooms in the Sacramento area for the past four years but still remains under the radar to major media. However, it continues to grow in leaps in bounds as AK Promotions events are expanding across the State. On May 5th in celebration of Cinco De Mayo AK Promotions will promote their second event at the newly renovated Oakland Convention Center, located in Oakland CA with fighters coming as far as the Netherlands! Official weigh-ins for the Sacramento show will take place at the Woodlake Hotel starting at 8:AM on Friday morning March 23rd. Doors and Happy Hour bars will open in the ballroom at 5:PM and fights will start at 7:PM. Parking is available at the hotel for a nominal fee. Tickets range from $40 to $80. The event is in part sponsored by Tecate beer, distributed by DBI Beverage of Sacramento, CA. Or contact AK Promotions via e-mail at johnnyd@akpromotions.org or call (916) 205-4762. Real Mental Preparation Training for Fighters. "GET BACK IN THE RING"
WINNER: Renaldo Santos By Unanimous Decision: 50-48, 50-49 & 50-49. WINNER: Ravi Rawji By Unanimous Decision: 50-46, 50-48, 50-46. WINNER: Marc Williams By Unanimous Decision 49-46, 50-45, 50-45. WINNER: Luke Davis By Unanimous Decision, 50-48, 50-48, 50-48. WINNER: Adam Aiwamiszekski By Unanimous Decision, 50-49, 50-49 & 50-48. RESULT: Majority Draw: 48-47, 48-48, 48-48. WINNER: Kurtis Farr By Majority decision, 48-49, 48-49, 49-46. WINNER: Andrew Gartside By Majority Decision 40-48, 50-48, 49-49. WINNER: Olegs Jablonins by TKO 1.19 R 4. 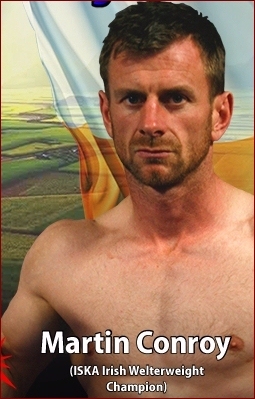 WINNER: Mark Timms By Unanimous Decision 50-47, 50-47, 50-48. WINNER: Steve Jones by Unanimous Decision 50-46, 50-47, 50-45. WINNER: Nathan Epps by Unanimous Decision 49-48, 50-48, 48-47. WINNER: Tom Holland By Majority Decision 47-48, 49-48, 46-48. World Title Fight In The USA! 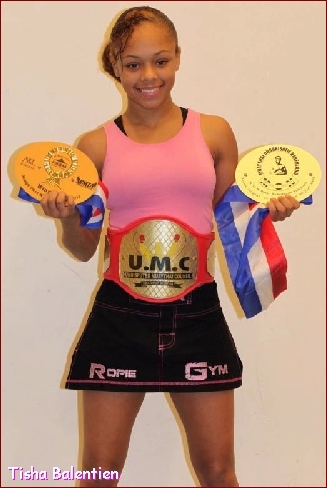 Today, 15 year old Junior Flyweight World Contender Tisha Balentien of Holland and her camp released a video message for her upcoming fight against undefeated and multiple IKF World Classic Champion...14 year old Katrina "The Storm" Nahe of Antioch, California, USA. "I'm going to win the world title." Although Juniors, this will be one of the most anticipated Muay Thai fights in a long time. With the aggressive fighting style of both young ladies, it's hard to imagine that either will take a step back! It will be an exciting and memorable evening in a Las Vegas fashion for two of the best junior female fighters in the World to showcase their skills! Johnny Davis' AK Promotions is proud to bring this fight together. As with his many promotions before, this will be a first rate show. The Junior title will be overseen by world recognized IKF Officials, specially trained as officials for Muay Thai. "Unlike some promoters who promote their own fighters for titles, I don't have any ties with either fighter." said Davis. "I'm just excited I was given the opportunity to bring these two fighters together. As an event Promoter, I just want the best fighter to win! Period! That's what its all about." Davis and everyone involved in this bout are just wanting both fighters to do as asked of any and every fighter... To end their bout knowing they gave their all! As the saying goes, if the bout is close, we would hate to be one of the judges. For big fights like this, trainers always tell their fighters, "Don't leave it to the judges!" That's not an insult to ANY judge, just a reality of every trainer and fighter. No one wants to question a decision, and chances are, with the way these two ladies ROCK, it may not go to a decision! If you are a fight fan, this is surly one of those "MUST SEE" match-ups! Without a doubt, It's going to be awesome! For more info, call (916) 205-4762. 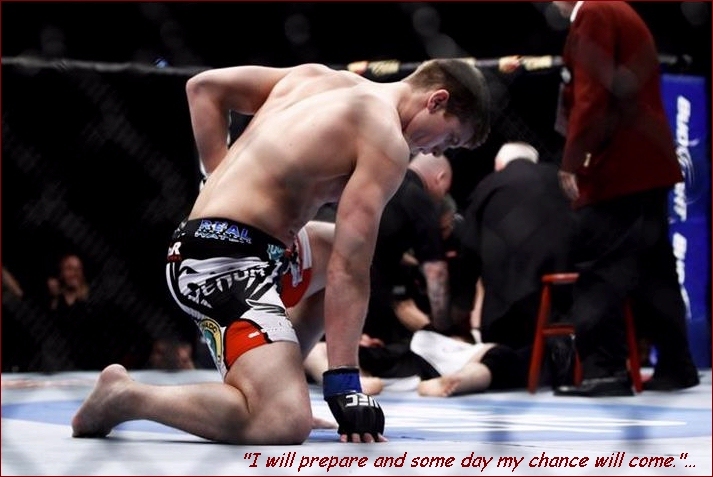 Stephen "Wonderboy" Thompson after he defeated Jeremy Joles by TKO in his UFC MMA Debut at UFC 143!